HARRIS COUNTY– The U. S. Attorney for Houston, Jose Angel Moreno, on Tuesday unsealed a federal grand jury indictment against County Commissioner for Pct. 4 Jerry Eversole and another, businessman Michael Surface. The 31 page indictment lists conspiracy, receiving a bribe, and filing false income tax statements against Eversole. It lists conspiracy and paying a bribe against Surface. Eversole and Surface appeared in federal court on Tuesday, bound in handcuffs and shackles, a pitiful site for a powerful office holder such as Eversole. Both defendants pleaded “not guilty”, and were released after posting $100,000 bond each. The charges stemmed from a corruption investigation that has been ongoing for several years, and of which Eversole was aware. He commented to several media representatives this year that he expected to be indicted. Eversole is charged in the detailed indictment, with receiving such things as vacations, clothing, antique firearms, and financial support for his home mortgage from Surface, and in return voting to award Surface and several of his companies with lucrative county contracts. He also appointed Surface to the Sports Authority Board, and even conspired to retire in favor of Surface assuming his commissioner’s seat, according to the indictment. Eversole’s attorney, Rusty Hardin, stated that the two men have been friends for over 25 years, and the dealings were personal and not related to county business or favors. Eversole’s trial is set for February 22 before Judge David Hittner. The government is asking for restitution of all monies, and punishment that could be as much as 20 years in jail. This Status Report, “HCC-Northeast and North Forest Community: One Year Later” is presented to provide an update on activities since Annexation in November 2009. Great strides have been made by the College in collaboration with the North Forest Independent School District and the North Forest Community. Notable among the great achievements is the development of a dynamic “Blue-Ribbon” Committe that has established a Vision for its work with the College and has developed an Incubator Process for implementation into a permanent HCC Campus facility within the North Forest Community. Shortly after annexation was approved by the North Forest Community on November 3, 2009, the Boards of Trustees of Houston Community College District and North Forest Independent School District approved a parnership agreement that would allow HCC-Northeast to lease classroom space at Forest Brook Middle School to establish the early beginnings of the HCC-North Forest Vocational Technical Campus. A schedule of classes was developed, and seven classroom were leased to offer courses on weekday evenings and on Saturdays. During the course of the year, over 500 traditional college students have enrolled in college-based courses at the North Forest Campus and have benefited from the tuition reduction that resulted from annexation. Over 260 students have enrolled in Dual Credit courses during that last twelve months and have benefited from the Tuition Waiver that was granted by the HCC Board of Trustees for all in-District Students in 2003. Thus, nearly 800 North Forest residents have benefited from college courses and instructional-support services that are now available to them at an accesible, affordable, and attractive location in the North Forest Community. Gayron Booker wasn’t the biggest guy on the Eisenhower Eagles defense, but he sure came up big during the 2010 season. Booker played outside linebacker for the Eagles, who finished second in District 18-5A. Although he stood 5-71/2 and weighed in at 188-pounds, Booker made plays all over the field in helping his team make a return trip to the playoffs. During his senior season, Booker recorded 52 tackles, eight sacks and recovered one fumble. 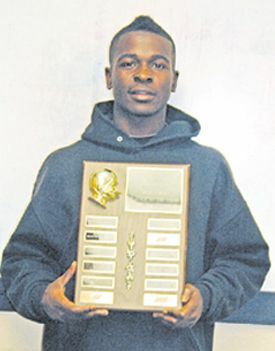 That output earned him the Northeast News’ Defensive Player of the Year award for the 2010 season. Booker began his high school career as a running back, but the Eagles had a glut of talented ball carriers when Booker was an underclassman and if he wanted to get on the field, he knew he had to change positions. During spring training of his sophomore year, defensive coach Dre Thompson, who now serves as Eisenhower’s interim head coach, asked him to do just that and things worked out rather well for both Booker and the Eagles. Booker said he was fine with the move, as long as he got a chance to play. The move was definitely the right thing because he became a two-year starter on a team that earned back-to-back playoff spots during his junior and senior seasons. Thompson said he knows Booker’s height will probably keep him from earning a Division 1 scholarship, but he said Abilene Christian University (ACU) has an interest in him and that might be the perfect place for the deeply religious young man. ACU may not be a Division 1 school, but it has produced a number of NFL players in the last decade such as defensive back Daniel Manning of the Chicago Bears, wide receiver Johnny Know, also of the Bears and Cincinnati Bengals running back Bernard Scott. And while he may be small in stature, Thompson said opponents knew they were going to get Booker’s best shot when he came up against them. Away from the gridiron, Booker is involved at this church, Shady Acres Church of Christ. He helps feed the homeless and also has a part-time job. And let’s hope Gayron Booker gets some help in his quest to continue his football career! James Jones isn’t the sort of guy who brags about himself, but others have no trouble signing his praises. As a senior, James, Eisenhower’s starting quarterback, led the Eagles to a second-place finish in District 18-5A and a return trip to the Class 5A playoffs. During his senior season, Jones completed 88 passes for 1,433 yards and 12 touchdowns, rushed for 1,295 yards (Jones averaged 7 yards per carry!) and scored 23 touchdowns and even caught two passes for 51 yards. He also helped out on defense (more on that later) as he intercepted two passes and returned one for a touchdown. As a junior, Jones passed for 1,423 yards and 7 TDs, and picked up 786 yards on the ground and scored 10 times. As a two-year starter, Jones accounted for 4,300 yards of total offense and an eye-opening 52 touchdowns. Not a bad two-year stretch! 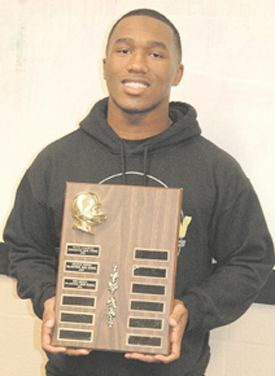 Jones’ stellar senior season earned him the Northeast News’ Offensive Player of the Year honors and Eisenhower interim head coach Dre Thompson said his star pupil was most deserving of the award. Jones doesn’t have the physical size of his boyhood idol, Vince Young, but he possesses outstanding speed and quickness. Even though he’s only 5-11, Thompson thinks Jones will get a chance to play collegiately. He’s heard from Baylor, Missouri, Army, Air Force and the University of Houston. The service academies have said he will get a chance at quarterback, while the other schools pursuing him would like to use him as a slot receiver/return man. Jones said while he loves playing quarterback, it does not matter where he is used once he picks a college. Thompson compares Jones to Chicago Bears wide receiver/return man Devon Hester, who played defensive back at Florida State and early in his NFL career before the Bears converted him to a wide receiver. Hester is also one of the league’s most dangerous punt/kickoff returners. Oh yes, there was that mention earlier of Jones’ penchant for making big plays on the other side of the ball. That was never more evident than in a non-district game against Class 4A powerhouse Dayton early in the 2010 season. With the Eagles clinging to a small lead and Dayton driving for the tying score, Thompson inserted Jones in at safety hoping he would come up with the play of the game. Jones did not disappoint. Football isn’t Jones’ only game. He’s the starting point guard on the Eagles basketball team and in the spring will run a leg on Eisenhower’s 400-meter relay team. When he isn’t excelling on the athletic field, Jones likes to spend time with his family and will be watching with keen interest when Oregon takes on Auburn in the BCS title game on Jan. 10. Jones will have a rooting interest in the game considering his cousin, Michael Huff, who played at Nimitz High a year ago, will be playing wide receiver for the Ducks and catching passes from one of Jones buddies, Darren Thomas, a graduate of Aldine High. That’s music to a coach’s ear! Scrap metal thieves have sunk to a new low in Northeast Harris County: Grave Robbing. Six suspects have been charged in the theft of more than 400 brass urns from Brookside Memorial Park. The Harris County Sheriff’s Office says that they have filed second-degree felony theft charges against Robert Wayne Conley, Doyle Aaron Glover, Crystal Diane Nichols, Lloyd Darrell Petty, Daniel Lee Stevens, and Tawny Maryssa Watson. Glover, Stevens, and Watson have been taken into custody. Lt. Jeff Stauber, from the robbery and theft division, said the theft occurred sometime between the evening of Nov. 5 and morning of Nov. 8 at the 290-acre cemetery in the 13000 block of the Eastex Freeway. Brookside says that the urns stolen are the kind used on gravesites to hold flowers. 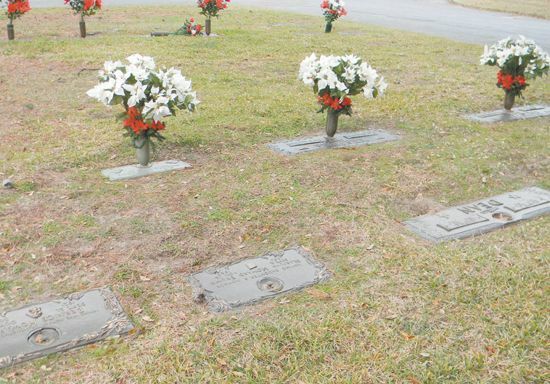 Cemetery employees found the urns missing, but the flowers placed back on the graves. Stauber said that it appears as though the urns were taken and sold for scrap metal. In total more than 2,100 pounds of brass was taken. The cemetery said that it is replacing all the stolen urns. With costs ranging between $300 and $400, the cemetery estimates the loss would have been $120,000. A break came in the case when a Houston scrap metal dealer purchased the urns from a dealer in unincorporated Harris County. Noting that the sale was suspicious, the dealer contacted Houston Police. Because of the scrap dealer’s reporting of the incident, Brookside was able to recover 310 urns. Stauber said that the urns were likely sold outside Houston first because the county does not have as stringent rules concerning scrap metal sales as Houston does. In Houston, someone wishing to sell scrap metal must provide a government-issued ID and thumbprint. License pate and vehicle descriptions are also recorded. If convicted the seven face up to 20 years in prison. 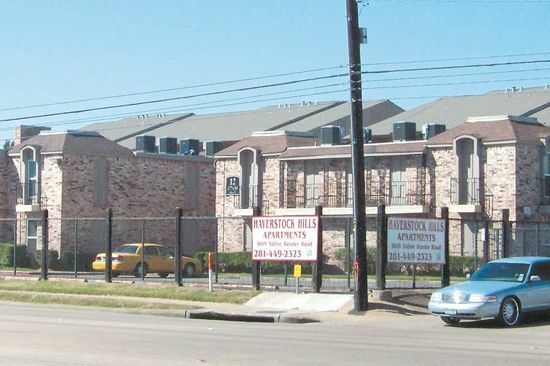 NORTHEAST HOUSTON– Judge Smoots-Hogan held a hearing last Friday on criminal activity at the Haverstock Hills apartments and the surrounding areas. As a result, she issued a temporary 45 day injunction, barring 28 identified alleged members of the Bloods and Crips gangs from entering or staying in the area. 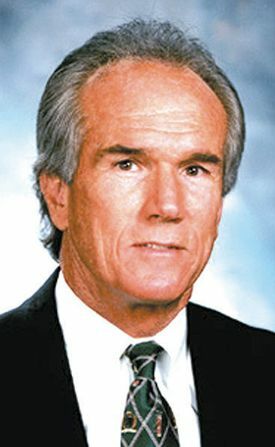 The action comes as a result of a lawsuit filed by District Attorney Pat Lykos last month, and is expected to become a permanent injunction. Testifying at the hearing were Sheriff Adrian Garcia and others. Those named in the injunction had an opportunity to appear, also. The Sheriff cited statistics that showed continual calls to the 700 unit complex, as many as 2,400 calls this year to date. Garcia said that known gang members committed most of the crimes they were called for. Others that testified included Kim Ogg from the DA’s office, and J. Allen, property manager. Ogg displayed a photo board with the 33 members named in the original request for an injunction. The injunction also bars the 28 named from associating with known gang members and each other, and does not allow them to show gang colors, hand signs, of have graffiti marking devices or weapons on their person. Also, they are not allowed to have cell phones, harass residents of the apartments, or disrupt traffic in the area. Violation of the injunction could result in arrest, with penalties of a year in jail and a $4,000 fine. The injunction extends beyond the Haverstock Hills property, to include a “safety zone” of 57 acres around the complex, and includes Francis Elementary school within the area. The boundaries are Aldine Bender, Picton, McCracken, and Lee Roads. Sheriff Garcia was previously a Houston police officer in charge of an anti-gang office, and since becoming sheriff has organized an anti-gang unit within his department. This anti-gang task force is housed in the Aldine area, but is responsible for stopping gang crimes throughout the whole county. ALDINE– Christmas Holidays were celebrated with a luncheon for senior citizens and students, last Thursday, Dec. 9 at Campbell center. About 1000 senior citizens and students from various schools attended, with a free luncheon, gifts and entertainment. The event was sponsored by the Aldine Council of PTA’s and the East Aldine District, and was entitle the “Nadine Kujawa Senior’s Holiday Gala,” in honor of the retired past AISD superintendent who attended and gave the welcoming talk. 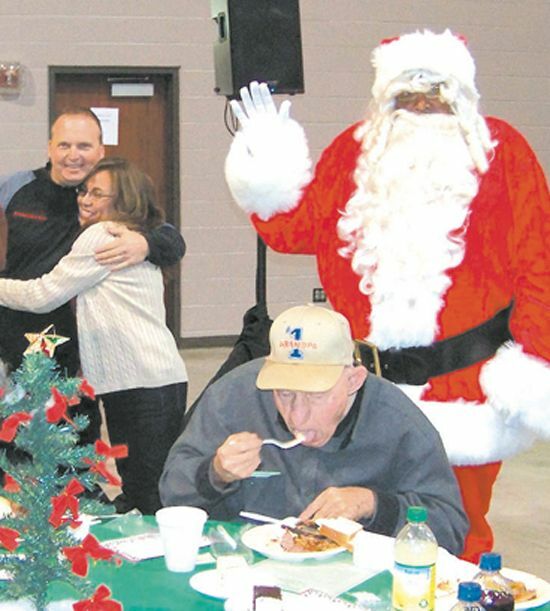 Other coordinators included Nancy Martin and Shirley Reed, with Santa and his elf present. Performing music numbers were Hinojosa, DeSantiago, Black, Oleson, and Goodman schools. Sponsors of the event included East Aldine District, Hawes Hill Calderon, Montgomery & Barnes Engineers, TSU Center for Aging, Grandparents Raising Grandchildren, and Aldine ISD, with a number of their schools represented also. GREENSPOINT– Houston Intercontinental Chamber members heard about the planned new 20 screen movie theater that Premiere Cinemas is currently building at the site of the former Penney’s store at Greenspoint Mall. The presentation was made by Gary Moore, president of the Premiere Cinemas company of Big Spring, Texas. The event was the monthly luncheon of the Chamber, held at the Sheraton hotel on JFK Boulevard last Thursday noon. Although the theaters have been in the planning stage for many years, it was only recently that demolition of the old Penney’s store was accomplished, and the construction of the new theater started. Moore explained that the Cinema should open in the spring, probably March 2011. Although Premiere Cinemas is a relatively small company in the movie exhibition business, he said, nevertheless they are the leader in using modern projection methods, including digital picture and sound for high quality presentations. 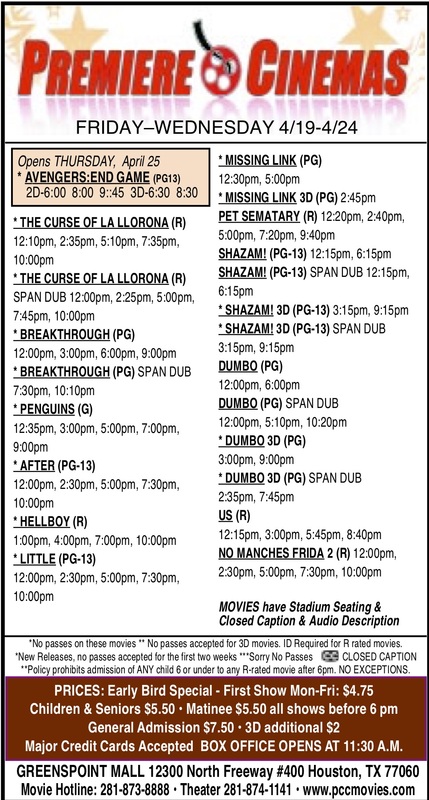 Premiere has four theaters currently operating in the Houston area, and a total of 207 screens nationwide. All of their theaters have digital technology. The new Greenspoint Mall cinema will also feature special seats that enhance the viewing experience. Moore said that this is the third theater in his chain that was designed especially for digital presentation. Moore said that new theaters are a good draw for additional business for malls, and they expect Greenspoint Mall to benefit from the theaters. Moore noted that the movie business has been good, even during the current recession. His company has seen growth of 7% in 2009, and 5% in 2010. Patrons attending the 20 screens at Greenspoint Mall could total from 500,000 to 1,000,000 in a year, and this could bring additional business to all the mall stores. The Cinema will employ from 100 to 150 employees in full operation. The theaters will be available for other functions too, he said, such as private parties, and business meetings or conferences. Premiere Cinema theaters also participate in community events, noting that they have a float in this year’s Christmas Parade in Baytown. Also in the negotiation stage is a possible IMAX theater for the complex. Reggie Gray, president of the Chamber, introduced Cathy Owen, the new director of the North Houston Economic Development Council. Ms. Owen spoke about the opportunities for new business developments that contact her office on a regular basis, and the positive indications this presents for future growth in the North Houston area. Reggie Gray welcomed the attendees of the luncheon, and gave a spirited talk about how to maximize the value of the Chamber by networking at events such as this meeting, and in particular he encouraged members to ask the speaker how to participate with their business. Gray pointed out that the Chamber gave small businesses access to large businesses, and their buying needs. In addition, Gray reported that the Chamber had enrolled 74 new members in 2010, and that the renewal rate was 92%, one of the highest in Houston.